Sorry, this is an old story. I've only just picked it up after it was posted on TitusOneNine. There is nothing about it on the ACNS site. The Global South site has an account of the address of the Primate, Archbishop Nathaniel Uematsu, to the 58th General Synod of the Nippon Sei Ko Kai (NSKK) meeting. The meeting was in May 2010, published in English in November 2010 and CEN in December. The article's headline 'Japan gives covenant backing' is misleading. It could as easily have been 'You are All at Fault'. the NSKK House of Bishops’ Theological and Doctrine Committee “have expressed their opinion that such a Covenant should not be necessary, as it provides restrictions and exclusions”. The bishops’ theological committee was not convinced that all Anglicans could or should be “ruled by this one agreement,” and balked at section IV. “One of the major characteristics of the Anglican Communion has been that in its long history the richness of diversity has been widely appreciated,” the Japanese Primate explained. The Archbishop asked the Synod to support the Covenant in the present confusion and because the probability of it being accepted was increasing. In other words, we don't agree with the medicine but please swallow it any way. If he made any other arguments they weren't reported. The Archbishop blamed the North American Anglican churches for having caused the war. He also distanced himself from the Global South leaders saying that they were acting in ways liable to create a new Anglican Communion which not only excluded The Episcopal Church and the Anglican Church of Canada but also the Archbishop of Canterbury. 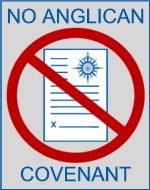 What this report does not say is that the 58th General Synod backed the Covenant. Perhaps it did, but I will wait for a clearer statement first. And if the NSKK does back the Covenant, after such clear earlier statements that they disliked and disagreed with it, what hope is there for the rest of us? 'Back the Covenant because other people back the Covenant' is barely an argument, it's more like bullying. Paul, forgive me. Yours is a serious post, but the lyrics of the song seemed to fit the moment. Delete if you like. I won't be offended. I take Helmer's point. My comment was ungenerous in this light and I'm sorry for it. I certainly heard the sentence in the same terms as which I hear it in the UK. Here it's barely nuanced at all. It's also true that much of the Archbishop's speech was not reported and that inevitably removes context and subtleties from what was being said. Any chance of a fair debate? Who is the Anglican Communion Office working for? Doors slammed shut! Windows blown open?